Do your students struggle with number fluency when it comes to fractions and decimals? 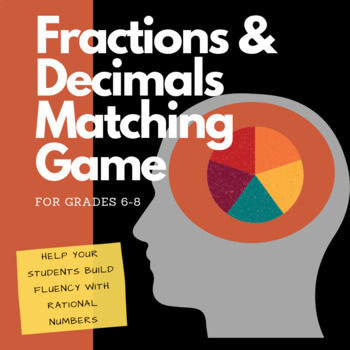 Here's a fun matching game for your students to play to help them gain fluency with rational numbers. In this activity, students are actively engaged in thinking about the concepts and talking about how to solve the problem while trying to find matching expressions. Unlike flash cards that can cause anxiety and promote rote memorization, this matching game improves working memory and promotes deeper thinking about the concepts. 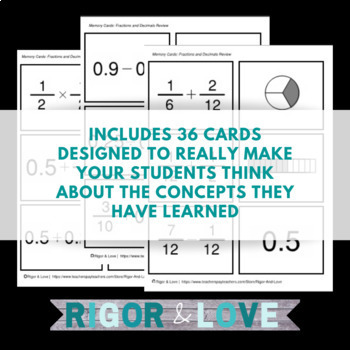 This matching game includes 36 cards help students gain fluency with fractions and decimals. Cards contain a mix of fractions, decimals, and pictorial representations. An expression involving the addition of two fractions might match to a decimal. Or a decimal divided by a fraction could match with a number bar. The mixed notations build deep connections and activate fluency. 1. A quick check for understanding/movement break: Lay one set of cards out on a table and give one card from another set to each student. (You can even differentiate by strategically passing them out) Have them bring you a pair. Repeat until most students have found a match or for as long as you'd like. 2. A way to choose partners for a paired activity: Give each student one card and ask them to find its mate. 3. A math center activity: set up a 6x6 grid and let 2-4 students play. The more students per game, the faster it goes. 4. An easy sub day lesson plan: Print multiple sets on cardstock and let the kids cut them out and play in pairs. 5. Make a March Madness bracket: Play every Friday during March to see who the fraction champion is in your class, and celebrate with pie on March 14! For added challenge: combine with other memory games in my store. I recommend printing onto colored card stock so you can easily tell each set apart. This game is designed to challenge students in 6th grade, but could be used in any middle school math class. I hope you enjoy this resource. If you download it, please leave a review!